Probably the greatest challenge facing the reform of public education in this country are the people who are trying to reform it. There is always a discussion of high academic standards, but the truth is that these standards have been watered down for so long that the majority of people trying to posit a functioning system are not up to the task because they too got a mediocre education. It is the simplistic thinking of these poorly educated bureaucrats that seems incapable of the intellectual rigor necessary to analyze and propose a well thought out program that has even the remotest chance of being successful. 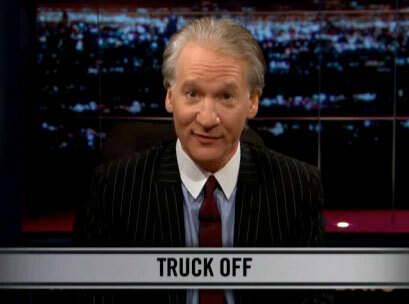 Bill Maher, somebody who does not suffer from these infirmities of thought process, trained his wit on the absurdity of just one aspect of what these intellectually challenged education reform wannabes saw as the reason for failing public education and annihilated them. For him, the thought of laying all the responsibility at the foot of the teaching profession is a "comprehensive education solution from completely ignorant people." According to Maher, "America has found its new boogey man to blame for our crumbling education system" in teachers. "The problem isn't us" and the fact that we have cut taxes, while fighting two wars that approach 1 trillion dollars -- which is having a catastrophic ripple effect throughout the foundational social institutions of this country -- can't be the problem. Clearly the problem begins with the "fat cat salaries" that we pay teachers, right? It is the witch hunt that is presently going on against teachers that we saw last week in Rhode Island that shows how little thought goes into a process that finds all 94 teachers worthy of firing. What Maher does effortlessly is ask the questions that should be posed before war is declared on teachers to scapegoat failed public education for a system that teachers had no part in developing or maintaining in a top-down education system where they are the peons who are never listened to. Maher sarcastically wonders "where these enlightened education leaders plan to hire new teachers -- from some undisclosed location?" The only place where I disagree with Maher to some extent is when he says "let's fire the parents." While it is true that getting parents on board is a critical component of student academic success, this presupposes that these parents have the skill set necessary to parent. It has always made me marvel how orwellian edspeak always defers to the parents in recognition of what both Maher and they realize is a critical component of success, but neither of them realize that just turning 18...or 14 as has been the case with several of my students, doesn't make you a worthy partner in the education of your children, especially if you didn't get any kind of education yourself and therefore have to work 3 jobs just to survive in costly Los Angeles. Wanting to fire the parents is scapegoating them for an educational system that they to were the victims of and that, so far, nobody seems to be willing to fix in a way that will end this generational failure mill that urban public education has been for generations. Fredrick Douglass said "It is easier to build strong children than to repair broken men." "...how little thought goes into a process that finds all 94 teachers worthy of firing." Wouldn't that be the same little amount of thought that goes into finding all 94 teachers worthy of lifetime appointments? And how can anyone say that teachers had no part in the creation and maintaining of the failed public education system? I would say teacher's unions are more responsible for the dysfunction than any one group. As far as teachers as peons, I have to say that part of that is because teachers unions have absolutely insisted on keeping teaching from becoming a true profession. Union-driven contracts treat teachers as interchangeable parts in some 19th century education factory. Teachers unions have worked to protect the adults in the educational sytem at the expense of the kids. Now people are saying enough is enough, and the unions are still complaining about money, etc. They really need to get ahead of reform or they're going to go the way of the air traffic controllers.